There’s nothing like being out on the water, getting away from it all, spending time with family and friends, letting the wind fill our sails and whisk us away to new adventures. It’s easy to get carried away — especially when it’s speed that we’re after. Along with that adrenaline rush we get when throttling up to catch a few waves comes a heavy responsibility. Being a safe boater, who observes the rules of the water while having a good time, is a necessary part of boating. Boating education can help us expand our knowledge and practical skills, increasing our competence at the helm or as crewmembers. A more competent boater is a safer boater. Every year in Canada, over 150 people die and 6000 are injured in boating-related accidents. Whether a novice or a veteran of the water, we each have more to learn to make the waters safer. Although books, CD’s, and other self-study resources are available, a classroom is the best place to begin learning about boating. The use of standardized and internationally recognized course materials, access to knowledgeable instructors, and interaction with other students are invaluable in the learning process. The Canadian Power and Sail Squadrons as well as various charter companies offer introductory boating courses on safety, seamanship, weather, rules of the road, useful knots, and many other aspects of boating. Many of these charter companies can be accessed through websites such as www.sailmag.com/charter. At the end of the courses, those who successfully pass a written exam receive a certificate of completion. In addition, they’re typically given the opportunity to write a test for the Pleasure Craft Operator’s Card (see below). This proof-of-competency card is intended to make our waterways safer for recreational boaters. Since every charter boat is required to have a VHF (very high frequency) marine radio, and because the law requires you have a VHF Restricted Radio Operator’s Certificate to use it, taking a marine-radio course is a must. CPS and some charter companies offer this course. Expect to learn proper radio protocol and procedures for accessing weather information, making urgency and distress calls, and communicating with other boaters and various shore facilities. A recent improvement in marine-radio technology called Digital Selective Calling (DSC) allows the radio operator to transmit a digital signal to all nearby vessels and the Coast Guard. When connected to a GPS receiver, this distress alert will send both accurate position coordinates and information about the vessel. So, even if you’ve taken a marine-radio course within the past three years, you should consider enrolling in the CPS-DSC module to familiarize yourself with this new technology. Most marine radios sold since 2002 include the DSC feature. With a Boating Course Certificate, a Pleasure Craft Operator’s Card, and a VHF Certificate in hand, you’re about halfway toward meeting the minimum qualifications for chartering. Your next step is to supplement your classroom training with on-the-water training, commonly referred to as a “cruise and learn.” Many charter companies offer introductory cruises where you spend three to seven days on the water under the guidance of a qualified instructor. Choose a sail or powerboat course depending on your interest and chartering intentions. In either case, you’ll appreciate having had some theoretical knowledge prior to participating in real-life situations such as crew overboard, close-quarters maneuvering, docking, anchoring, navigating, and other practical skills. Typically, at the end of the cruise you’ll receive a Competent Crew Certificate indicating that you are able to perform these various skills to the satisfaction of your instructor. Cruise-and-learn courses for more experienced boaters are also available through various charter companies. At this point, you have the absolute minimum of classroom and on-the-water training and certificates to charter a cruising boat on your own. If you desire more knowledge and experience, consider going on either a skippered or flotilla charter. On a skippered charter, an experienced skipper is responsible for the safety of the yacht and you can participate and learn as much as you like. On a flotilla charter, you’re in charge of a yacht but a qualified skipper is on a nearby boat to offer assistance if required. Most charter companies and many qualified individuals offer skippered charters. In Canada, Cooper Boating in Vancouver (www.cooperboating.com) offers the flotilla experience locally, although worldwide companies such as Sunsail (www.sunsail.com) and the Moorings (www.moorings.com) offer this option in various tropical locations. After your skippered charter or flotilla experience, perhaps you’re ready to turn your chartering dreams into reality? If so, you may want to charter through the same company that provided your cruise-and-learn course since they are already familiar with your skill level. On your first solo bareboat charter, consider taking along a knowledgeable crewmember to provide assistance and even assume command of the yacht if necessary. Few things in life will give you a greater feeling of accomplishment than becoming a competent boater. Imagine the satisfaction you’ll get when setting your course for a distant port and, relying on your newly learned nautical skills, arriving safely and anchoring securely in a picturesque bay. Of course, not every boater has an interest in chartering a cruising yacht. The majority of people are more interested in fishing, jet boating, water skiing, day sailing, canoeing and kayaking. A common question is heard from this group of boaters: “Why should I take a boating course if all I do is kayak or fish?” Let’s look at a few examples of how potentially fatal accidents could have been avoided had the boaters in question been more knowledgeable. A sea-kayaker attempting to transit a narrow passage at high tide nearly drowned when he encountered strong rapids and whirlpools that dumped him into the saltchuck. He assumed, wrongly, that high tide would be slack tide. Fortunately, he survived to learn in his first boating course that time of slack is determined by current tables, not tide tables, and can often occur an hour or two before or after high tide. Two fishermen eagerly launched their 16′ runabout on a calm sunny morning and while trolling near shore in Lake Ontario, ran out of gas. Unfortunately, the weather quickly deteriorated with increasing wind and waves pushing them miles offshore. All afternoon they hung on for their lives, bailing frantically. A passing sailboat noted their predicament and alerted the Coast Guard, which contacted a local towing company. Only their pride and wallets suffered. Preventable? Of course … every boating student could have told these guys to have a fuel reserve of one-third of the anticipated fuel usage. Other precautions should have included checking the weather forecast and carrying a handheld VHF radio. Here’s one more example to illustrate that it’s not only novice boaters who can benefit from upgrading or revisiting their nautical skills. Old salts often get into difficulty because of inadequate or forgotten knowledge. I was recently anchored in Nanaimo Harbour when a 45′ steel-hulled sailboat ran aground while attempting to pass a yellow-black-yellow coloured buoy on the east side. After assisting the bewildered skipper in kedging off the reef, I asked what the buoy indicated to him. He said he thought it marked an isolated rock and could be safely passed on either side. Not so. This West Cardinal buoy indicates that safe water is on the west side. The moral of this incident? No matter how salty you feel, keep learning … there’s no substitute for safe boating. Most classroom and cruise-and-learn courses involve groups of students learning the same standardized material and skills. The CPS boating courses often have 20 to 30 students; a cruise-and-learn typically involves four or five students on a yacht. However, individualized instruction is also available for those who prefer more privacy or seek to improve specific skills. 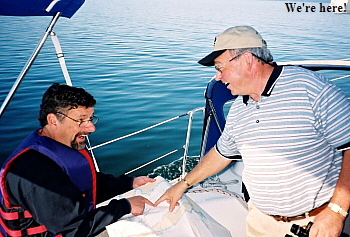 Instructors, certified by Sail Canada or the International Sail and Power Association, can tailor instruction to meet a boater’s specific needs whether docking under power, heavy-weather sailing tactics, night navigation, racing strategies, cruise planning, or the use of electronic navigational aids such as sonar or radar. This instruction is especially helpful for more experienced sailors and can occur either on your own boat or on a rented boat. While adults make up the majority of students in CPS Boating Courses, teenagers typically access the CPS Boat-Pro course to learn basic boating information. On-the-water experience for youngsters is provided by a number of boating clubs, several examples of which are listed below. In some cases, participants are not required to be members of the club. On Vancouver Island, the Sidney North Saanich Yacht Club (www.snsyc.ca) offers a summer sailing school for all levels of sailors, ages 8 to 18. Courses include both theory and on-the-water skills provided by Sail Canada certified instructors in a fun, positive atmosphere. Youngsters learn a progressive series of skills from rowing to advanced sailing techniques, including racing. In Vancouver, the Royal Vancouver Yacht Club (www.royalvan.com) provides a fun and safe learning environment for young sailors. 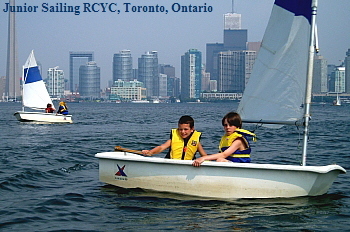 Their curriculum is centered on Sail Canada’s Learn-to-Sail Program, ranging from basic sailing techniques (Level 1) through to racing strategies (Level 6). In Toronto, the Royal Canadian Yacht Club (www.rcyc.ca) has two junior sailing programs: learn-to-sail and racing. Both programs use Sail Canada standards, giving youngsters the opportunity to experience the sport of sailing in a safe, fun-filled, and challenging environment, matched to the interest and skill level of each child. Women Two charter companies in British Columbia, Cooper Boating (www.cooperboating.com) and Herizen (www.sailingforwomen.com ), offer unique cruise-and-learn courses designed by women, for women. The Herizen courses also include self-awareness programs, yoga, and executive sailing retreats for women intended to enhance their wellbeing. Sailors with disabilities The Disabled Sailing Association of British Columbia (www.disabilityfoundation.org/dsa/) based at Jericho Sailing Centre in Vancouver offers a variety of programs for people with disabilities. Currently, over 300 participants are provided with opportunities for recreational and competitive sailing, as well as instruction for first-time sailors. The aim of DSA, with the help of over 80 volunteers, is to increase the independence, motivation, and quality of life for both children and adults with significant physical disabilities. Boating can be a fun-filled activity offering excitement, friendship, exercise and improved wellbeing. It can also be a terrifying disaster for those with insufficient knowledge or experience. The choice is yours: be a competent boater or risk being an annual statistic. As noted in this article, a variety of instructional resources are available in Canada to increase your competence, regardless of your current skill level. Take advantage of them. You owe it to yourself, your loved ones, and your boating companions to ensure your outings on the water include a return trip. CPS is a nationwide organization of boating enthusiasts, mostly volunteers, whose aim is to increase boating safety by providing classroom instruction in all aspects of boating, both power and sail. 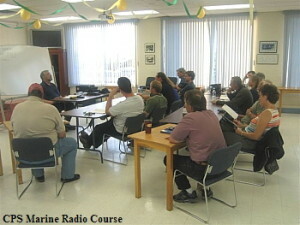 Nearly 200 squadrons in Canada offer the Boating and VHF marine radio courses. An abbreviated boating course called Boat Pro is available for those seeking their Pleasure Craft Operator’s Card. Advanced courses for members include Piloting, Advanced Piloting, and Celestial Navigation. Elective courses and seminars available to the general public include Marine Electronics, Marine Maintenance, Seamanship Sail, Extended Cruising, Weather, Global Positioning Systems, Depth Sounders, and Distress Signaling. 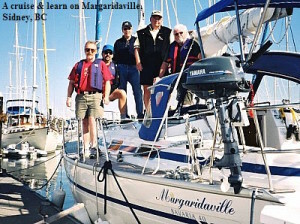 Member agencies such as yacht clubs, sailing schools, and certified individuals offer a wide variety of internationally recognized boating courses from beginner to expert. They also offer boating programs tailored to the needs of youngsters, women, and people with disabilities. Many charter company instructors are certified according to Sail Canada standards. The ISPA, through individual instructors and member agencies, provides a range of instructional programs both classroom and practical with an emphasis on the safe and skillful use of sail and power boats. Their books and courses offer a comprehensive program designed for students to learn at their own pace. Many charter company instructors are certified according to ISPA standards. The office of Boating Safety within Transport Canada has a “competency requirement” for all operators of motorized watercraft used for recreational purposes within Canada. One proof of competency is in the form of a Pleasure Craft Operator’s Card. All operators of motorized watercraft are required to have a PCOC unless they have proof of having taken a boating-safety course prior to April 1, 1999 or, for rental boats have completed a rental-boat safety checklist. The Card can be obtained by successfully completing a Canadian Coast Guard accredited test. These multiple-choice tests are administered on-line, at local boat shows, and through various boating organizations such as Sail Canada and International Sail and Power Association member agencies and CPS. The law is enforced by random on-water checks by police or RCMP with fines up to $300 for operators not in possession of their Card.